Bob Shennan has been appointed the new controller of BBC Radio 2 and 6 Music, succeeding Lesley Douglas who resigned over the Russell Brand affair. Shennan was a senior figure in BBC Sport before becoming head of BBC Radio 5 Live in 2000 and controller of the Asian Network in 2004. He is rejoining the BBC after leaving for Channel 4 Radio last year. Douglas, who announced her resignation in October, was in charge of the BBC's two radio networks from 2003. Lewis Carnie was acting controller in the months following Douglas's departure. 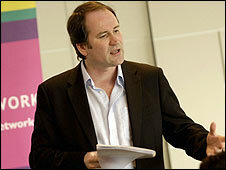 Shennan said: "Radio 2 is the cornerstone of UK radio. 6 Music is at the forefront of digital radio. "It is a privilege to be asked to lead the extraordinary creative forces of both stations," he added. Tim Davie, the BBC's director of audio and music, said: "Bob's energy, enthusiasm and passion for Radio 2 will ensure that the station remains creative and vibrant, and continues to offer unique programmes to the widest possible audience." Shennan's other career highlights at the BBC include overseeing the launch of 5 Live Sports Extra in 2002. In October last year, Channel 4 shelved its entire radio project to make around £100m in savings. Douglas went on to join record company Universal as its director of programming and business development.